This is the complete 3rd issue of the iconic 90s motocross magazine Inside Motocross. Published by AXO Sports Jim Hale and helmed by Fran Kuhn, Inside motocross was incredibly influential within the motocross and supercross industry. Even though it only lasted 4 issues, its influence continues to be felt to this very day through magazines like RacerX Illustrated and Meta. I have gone through and scanned the entire magazine and added my thoughts and recollections about this issue and its ads, photos, and content in the video below. 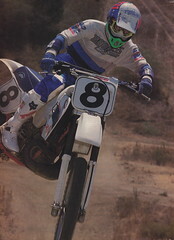 I hope you enjoy this slice of motocross history.